DOVER, Delaware (June 15, 2016) – A stately farm homestead and approximately 333 acres of land adjacent a high-end residential development will be offered at auction Thursday, July 28, with Murray Wise Associates LLC marketing the property and conducting the auction in cooperation with Woltz & Associates. The property includes 316 acres of productive irrigated farmland located within Kent County’s Growth Overlay Zone, as well as a 4,000-square-foot custom brick home. 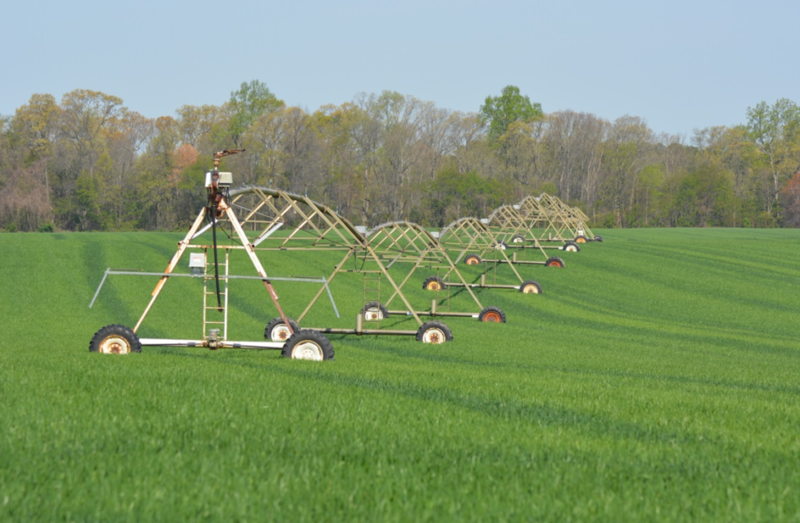 “Most of the farmland is contained in two irrigated tracts – one 182 acres and the other 134 acres. Historically, this land has been planted in potatoes, and it is now being leased and planted in winter wheat and peas,” said Joe Bubon, president of Murray Wise Associates. “The land being offered really is an investment double play – currently productive cropland, but also sitting in the path of future growth, next to The Orchards, a high-end residential neighborhood only minutes from downtown Dover. By offering the property in tracts, we make it possible for someone seeking just the home to purchase that. A farmer, developer or investor can bid just on the farmland. Of course, someone might very well buy the entire property and have a self-contained estate farm with long term development potential,” said Bubon. The property also has several farm buildings, including a 25,000-square-foot produce packing and cold storage facility and an 8,800-square-foot employee housing facility. Auction personnel will be available at the property, 2955 Walnut Shade Road, Magnolia, from 4 to 6 p.m. on June 23 and July 7. The auction will begin at 10 a.m. Thursday, July 28, in the Conference and Training Center of the Delaware Technical Community College, in Dover. Individuals seeking additional information may visit www.murraywiseassociates.com, or call 800-607-6888. Murray Wise Associates LLC, headquartered in Champaign, Illinois, is a leading national agricultural real estate marketing and financial advisory firm, with additional offices in Naples, Florida and Clarion, Iowa. Woltz & Associates, headquartered in Roanoke, Virginia, is a leading auctioneer of land, commercial and residential properties and other high-value real estate throughout the United States, with an emphasis on the Mid-Atlantic Region.